Traditional, Angelic, or Custom Created Pentacles/Talismans. We have secured agreement with the Order of the Light of the Rose (OLR) who will offer this new service to create for our readers traditional and custom Talismans, Pentacles, and Amulets, designed to provide protection, healing, meditation, love, wealth, and spiritual advancement. All the Pentacles or Talismans created are inspired by the traditional Magickal Grimoires, Planetary/Astrological magick. The OLR will also create custom objects of power based upon your birth archangels and your birth angel of the ascendent. These are traditionally created using Hebrew, Latin, or Greek, appropriate magickal alphabets such as Theban, Celestial, Passing the Rivers, as necessary, and geomantic planetary symbols and sigils. They are printed on quality parchment paper, over-drawn by hand, and hand coloured using watercolours. Initially created using computer graphics software, but being over-drawn using black magnetic ink. The actual original created image file will be supplied to you so you make future copies at will. Remember the Talisman, Pentacle or Amulet supplied to you are hand-finished and water-coloured. These magickal items are created at the correct Astrological and Moon period, and supplied with full instructions for private dedication and consecration. These are real magickally prepared Pentacles or Talismans NOT mass-produced items. Example only of a Mercury, Archangel Raphael Talisman. As you can see the talisman example on the right includes an invocation, traditional planetary sigils, and images. The actual talisman in this example is of Solomonistic original, produced on high quality antique aged parchment paper (size A4), talisman has been hand over-inked, using ink into which loadestone has been added, and coloured by hand using watercolour paint in the appropriate colours for the planetary spirit. Additional Sigils and geomantic shapes are also added as appropriate to the talismans function. Currently the OLR will create for you two forms of talisman. Dedicated talisman to your Birth or Moon Archangel or Both. Or a talisman dedicated to a particular objective i.e. protection, luck love etc. Birth Sun or Moon or both Archangels Talisman. This is a unique opportunity to have a traditional angelic talisman designed to your personal birth details, by an experienced Adept of the Order of the Light of the Rose. These talismans are created at an astrologically auspicious time, but before ritually consecrated they are nothing more than an interesting design, lacking any magical or spiritual charge. Our talisman conforms to the Art of Talismanic Magick, a consecrated and sacred object. You will need to supply time, date of your birth and city/country of your birth, and a preference to which archangel you wish your talisman to be created for i.e. Sun or Moon Archangel. From this information we will establish the appropriate talisman for you. Your talisman will be uniquely created talisman for you. This talisman is not a mass-produced talisman. The best thing you can do, is to make the talisman yourself. The second-best thing is to have it made by someone who has dedicated his life to this art, and who can mediate between this and the other reality or celestial world. Our Adept can ‘catch’ the symbolic keys for you. 1. Establish the correct designed talisman based on traditional magickal symbolism. Include, as necessary, the correct planetary rulership’s for the archangel and ruling planet, characters, geomantic symbols, and sigils. 2. Ensure the talisman is aligned to your Sun or Moon Archangel (or both). 4. Invocation in the appropriate angelic script. 5. Orphic Hymn to the planet. 7. 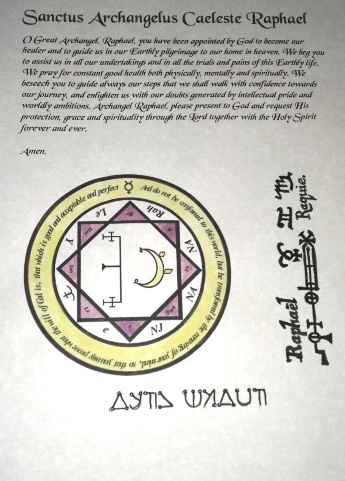 The created talisman is printed onto good quality parchment paper. A computer file of the template is also supplied. 8. Give the most appropriate dates and ritual requirements when and how the talisman should be consecrated. It should be noted that these angelic talismans are not created on metal discs, but parchment paper. Our angelic talismans gain their powerful talismanic ability directly from the Holy names of the angelic beings and the highly spiritual Qabalah formulae of sacred celestial words embedded into the talismans design. It is a well-known truth that mystics, spiritualists and shamans have long regarded that on simply coming into physical contact with angelic words that person will instantly start experiencing beneficial waves of angelic blessings and good-fortune as a result, and will see important aspects of their life change for the better. All our talismans are genuine holy items which have been created by our Adept to act as an angelic spiritual barrier to evil but also a conduit to attract beneficial good fortune and protection for their owners. 1. Be establish as to the correct designed talisman based on traditional magickal symbolism. Include, as necessary, the correct planetary rulership’s for the archangel and ruling planet, characters, geomantic symbols, and sigils. 2. Ensure the talisman is aligned to the appropriate Spirit or Angel. 7. The created talisman is printed onto good quality parchment paper. A computer file of the template is also supplied for your retension. 8. We will establish the most appropriate dates and ritual requirements, when and how the talisman should be consecrated. Please ensure that you complete the order form as accurately as possible and email it back to Archan. You may complete by hand, scan and email back to us if you wish. Once the OLR has reviwed your request a proposed talisman design will be submitted for your approval. Talisman or Pentacle for: Created using solomistic pentacles. 1. Why do you mention Pentacle and Talisman, are they different? The Terms Talisman and Pentacle may be used interchangeably, generally a Talisman is a object charged with a need, the same as a Pentacle. So for Pentacle read Talisman and visa-versa. Whilst on this subject, an amulet is traditionally an object of protection. 2. If the talisman is printed onto the parchment paper it cannot be a true hand-created talisman!. Yes it can. In recent times it has become the practice to over-draw the any printed talisman images. By this I mean that the talisman is over-traced with ink (magnetic) by hand. This is effectively creating the talisman from a personal input perspective and is an accepted practice. Also the talisman were necessary is hand-coloured with water colours. So you can be assured that the talisman you receive is true to the philosophy of the Angelic Art. 3. How does the talisman gain it power? The talisman is created when the astrologcal signs are correct. You will be informed of this time. Once created it will be supplied with a personal empowerment ritual which you should perform. The talsiman will then be empowered. 4.When do I pay for the Talisman? You only pay when you receive an email telling you the Talisman is ready to be sent to you. You pay we then post. 5. What do you do with my personal information. Once your order is complete we destroy your personal data. We NEVER supply to ant third part and is only use by Archan to post your order to. More information and pricing coming soon. You may also email your suggestions and comments.